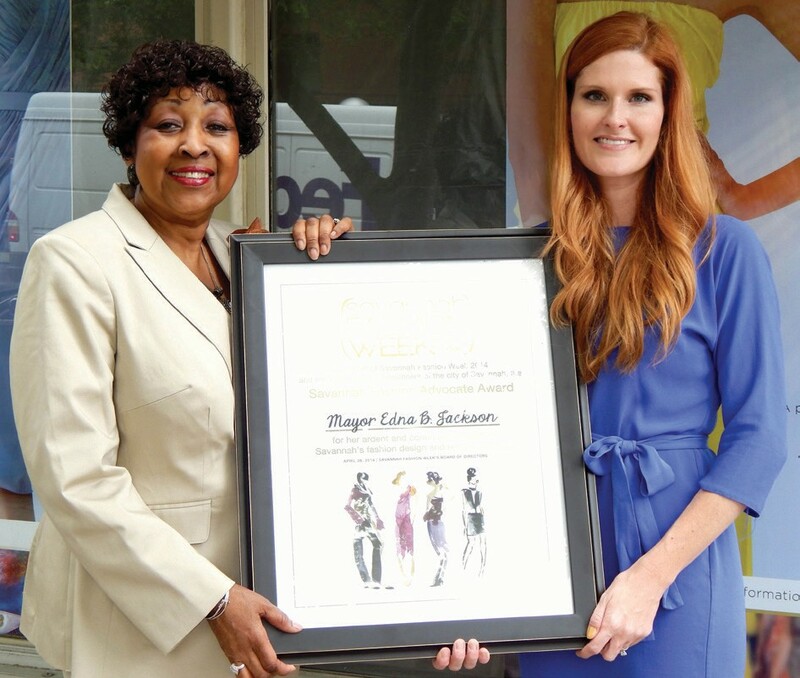 The organizers of Savannah Fashion Week 2014 have announced a week-long series of events which kicked off Monday, April 28 with the presentation to Savannah Mayor Edna B. Jackson of the Savannah Fashion Advocate Award, and running through Saturday, May 3. Among the highlights of the week will be the premiere of the Savannah Fashion Week Runway Show in Forsyth Park on Thursday, May 1, at 7pm. This year’s runway show features the area’s best local retailers and, for the first time, collections from Savannah’s most exciting independent designers. Tickets start at $50 and are still available on www.savannahfashionweek.org. 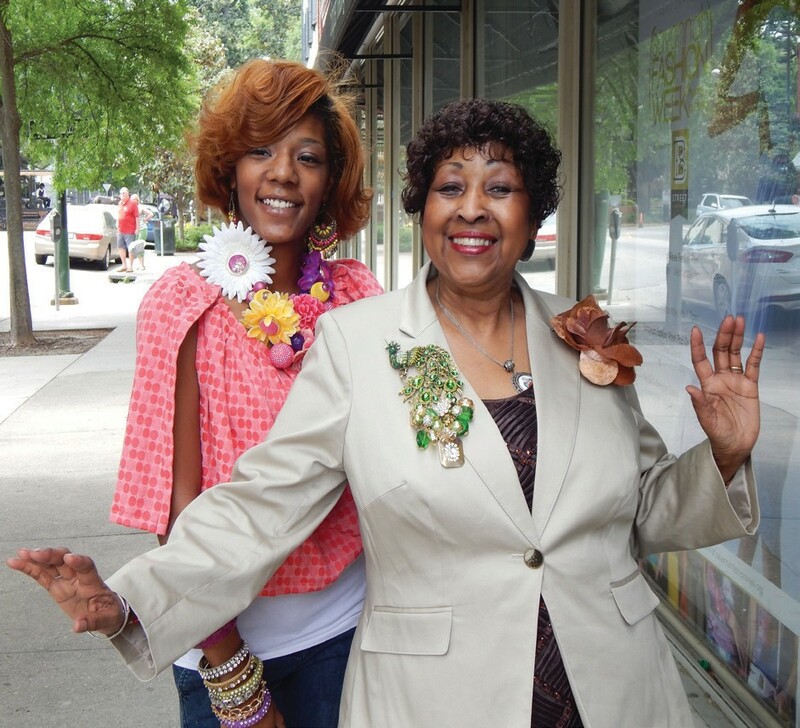 Mayor Edna Jackson shows off brooch designed by Jas’mon Tierria (L). Pop-up Shop will be held on Friday, May 2, 12 noon until 7pm at 201 West Broughton Street (corner of Broughton and Bull). A onetime only opportunity to shop the looks presented on the SFW runway by the official retailers and independent designers of Savannah Fashion Week. $5 donation at the door goes to Savannah Style Fund. On Saturday, May 3, from 10 a.m. – 6 p.m. The Faith Thornburg Trunk Show, Ivory and Beau, will be held at 2302 Abercorn Street, #1B. It a show of the bridal collection from Faith Thornburg. Also a Mix Julep Trunk Show will be held at 5500 Abercorn Street. Shop the spring and summer collections from local Savannah designer, Kathryn Hayes. Savannah Fashion Week runs through May 3, 2014. Celebrating its fifth year, it showcases the best of Savannah design, including fashion, accessories and jewelry. For more information, log onto www.savannahfashionweek.org.